Well the year 2013 is over today and tomorrow will bring in the year 2014 with trepidation and instability in the middle east and the world. Yesterday two bombs exploded in Russia and it seems that Islam is behind this event. The video by Mr. Gary Stearman brings us resent news about the USA joining with Iran and Syria to fight Al Qaeda in Iraq.Will this new year bring us the wars caused by the White (USA) and red (Russia) horses of the Apocalypse who together with the Black and pale horses following them to bring death to 1/4 of humanity (7,166,600,000) or 1,791,650,000 humans dying. Well not something to look forward to on the New Year 2014. The Christians will look forward to the Rapture before these events occur and thus safety in the hands of Jesus from the clouds of heaven. Dec 31, 2013 Will Islam be the power of the Antichrist? The video linked below will explain a very possible interpretation of the mark of the beast and the Antichrist. The only reason that I find this difficult to believe is that the Islamic countries do not have the military, economic or scientific whereabouts to bring this to reality. The defeat of the Muslim nations are recorded in Psalm 83 and Ezekiel 38-39. With Obama being the Antichrist and him being a Muslim believer it may be possible that he uses the power of the USA as a launching platform for the conquest of the world. The Christians will have to be taken away before he can rise to power and at that point he may take control of all the USA and transfer his military and economic control to the middle east. Thanks to Brian B. for his post. Make sure you watch the video to the end. As earthquakes, volcano’s activity and upheavals in nature are part of the prophetic writings that will be present in the end times this news is of importance. In the past some scientific reports have said that a volcanic eruption in the El Hierro volcano can trigger a great earth slide into the ocean that could produce a mega tsunami that would reach the Atlantic coasts of the USA with disastrous consequences. A view of El Hierro island’s coast on Nov. 6, 2011, after an underwater volcano eruption, in the Canary Islands, southwestern Spain. Two years after a new underwater volcano appeared offshore of El Hierro in the Canary Islands, earthquake swarms and a sudden change in height suggest a new eruption is brewing near the island’s villages, officials announced Friday (Dec. 27). After the announcement, one of the largest temblors ever recorded at the volcanic island, a magnitude-5.1 earthquake, struck offshore of El Hierro at 12:46 p.m. ET (5:46 p.m. local time) Friday, the National Geographic Institute reported. Residents on the island reported strong shaking, and the quake was felt throughout the Canary Islands, according to news reports. The earthquake’s epicenter was 9 miles (15 kilometers) deep. 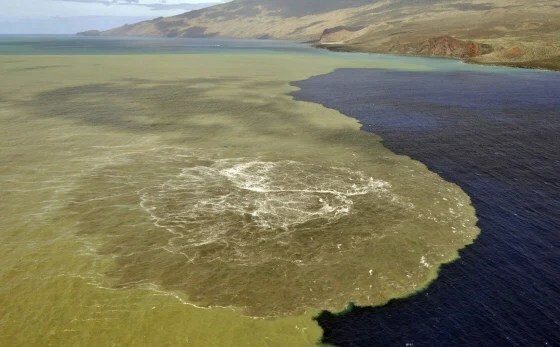 Before the earthquake struck early Friday afternoon, the island’s volcano monitoring agency, Pelvolca, had raised the volcanic eruption risk for El Hierro to “yellow.” This warning means that activity is increasing at the volcano, but no eruption is imminent. A similar burst of activity prompted a yellow warning in June 2012, but the volcano soon quieted down. Parts of El Hierro have swelled nearly 3 inches (7 centimeters) in the past week, with the growth centered between El Pinar and La Restinga, according to Involcan, the Volcanological Institute of the Canaries. More than 550 earthquakes rattled the island between Monday and Wednesday, also centered on La Restinga. About 30 of the earthquakes were greater than magnitude 3, Involcan said. The earthquakes are triggered by magma rising underground, fracturing rocks and swelling the surface as the hot rock reaches upward. “The earthquake swarm corresponds to a new magmatic intrusion,” Involcan said Friday morning in a statement. Friday’s preliminary magnitude-5.1 earthquake was on the opposite side of the island from the ongoing swarm. El Hierro was the site of a spectacular underwater volcanic eruption in 2011, which severely affected island fisheries and forced islanders to evacuate. The three person interview linked below explains the reasons these three individuals have concentrated their energies, resources and time to the topics of the Nephillin, giants, UFO’s and the topic of the end times coming and the approaching Tribulations. It is a very educational exchange of ideas and concepts that are at the vanguard of the prophetic times that we are in. There are several articles and videos from all three gentleman and I have read many of their books. Bible prophecy deals with the past fulfilled and the prophecies that are yet to be fulfilled. As the readers can understand it is a very difficult subject and from the discussions in the interview much of the church is involved there seems to be a lot of controversy about the subjects that these individuals have taken. I am of the opinion that they are correct in their interpretation of these subjects and their objective is to warn the church and the world of the tools that Satan is using to destroy mankind and establish his rule on earth during the seven year Tribulation. If you read Revelation there is no escaping the conclusion that it will be a time of death destruction and evil where the supernatural forces aligned with the devil will manifest their presence and destruction enormously. It is these manifestations of the supernatural demonic forces that is the subject of their collective studies and writings. This morning 12/28/13 I opened my computer and MSN page had the following videos about aliens. They are preparing the world for the great deception that was discussed in the prior interview. In the video they make reference to metals and objects found in different parts of the world buried in soil and rock formations that they say were millions of years old. This is also part of the deception in that these assigned times is part of the Darwinian evolution atheistic denial of God’s creation intermingled with the believe in aliens or extraterrestrials. What you see are celestial machines used by God , His good angels or fallen angels who followed Satan in his rebellion against God. Yes the Bible documents these objects in many places and this has been the inspiration of artists for many centuries. 5The Lord saw how great the wickedness of the human race had become on the earth, and that every inclination of the thoughts of the human heart was only evil all the time. 6The Lord regretted that he had made human beings on the earth, and his heart was deeply troubled. 7So the Lord said, “I will wipe from the face of the earth the human race I have created—and with them the animals, the birds and the creatures that move along the ground—for I regret that I have made them.” 8But Noah found favor in the eyes of the Lord. 9This is the account of Noah and his family. Dec 18, 2013 Cartoon shows Obama as Antichrist and Barbara Walters says he was called the Messiah, are they both correct? Those who study Bible Prophecy can discern what is written in the prophecies more readily than the general public who is not familiar with the Bible. There are a few exceptions that stand out as they have been the subject of popular culture and Christian societies for hundreds of years. Many are familiar with Christmas as the birth of Jesus even if they have never opened the Bible and are unbelievers. Another antithesis to Jesus is also popular as movies, books and word of mouth have introduced Satan and the 666 for many years. Once in a wile cartoonist dwell with Bible characters as they represent good or evil living people, politicians more than others as a character from the Bible. It is interesting to see how the president of the USA has been characterized by a Biblical persona in the last week on this season of Christmas. and from the best to the worst as being the Antichrist the 666 today by Stephan Pastis a cartoonist whose strip Pearl Before Swine is very popular. It is very important to understand that both pictures are correct Bible interpretations as the Antichrist will claim to be the Messiah of the Jewish people and will try to deceive the world into worshiping him as God and the true Messiah when in reality he is the son of Satan who will try to place his throne on earth and prevent the true Kingdom of Jesus Christ from becoming a reality. The identity of the Antichrist will be revealed for sure at the beginning of the seven years of Tribulation, but at the present time with what we know it is a probable and certain assumption to believe he will become the Antichrist in the very near future. We know the ending to this drama which will be played in the years to come. If the reader is unaware of this ending please follow the link below and read the story. As a side note the cartoon strip name is taken from a Bible Passage.